Equality Day, also known as Minna Canth Day, is observed in Finland on March 19 each year. 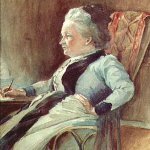 It is the birthday of Minna Canth, a Finnish playwright, novelist and social activist who fought for women's rights. Minna Canth was born on March 19, 1844. She began to write after the death of her husband, Johan Ferdinand Canth, while raising their seven children as a widow and managing her family's drapers shop. Her works addressed issues of women's rights. Canth was convinced that women had the right to express and realize their aspirations. Her best known plays are The Pastor's Family, The Worker's Wife, and Anna Liisa. Canth was a controversial figure in her time as her ideas did not fit the context of the prevailing culture. Besides, Canth's advocacy for her point of view was sometimes excessively strong which did not help to get supporters. But in modern Finland her contribution to the struggle for social equality is duly appreciated. Equality Day was established in 2007 to honor Minna Canth and raise awareness about the importance of social equality. On the occasion, the flag of Finland is traditionally flown. Minna Canth is the first and so far the only woman to receive her own flag day.